The University of Michigan is in turmoil over the administration’s recent decision to move forward with accommodating alt-right leader and white-nationalist Richard Spencer’s request to speak on campus. Spencer is a pathetic and repulsive provocateur who appeals to the most noxious degenerates in our country. He is also a U.S. citizen, and is entitled to the protections of free expression guaranteed in the First Amendment of the U.S. Constitution. The Michigan Review Editorial Board firmly believes that the University is making the right decision by upholding free-speech and seeking accommodations for Richard Spencer’s request. As a public institution, the University cannot partake in content-based discrimination of speech that does not fall within legally-determined categories of prohibited speech, like defamation or incitement toward violence. Legal precedent restrains the state from discriminating against the content of speech to prevent it from suppressing certain ideas, no matter how incendiary they are. Many have argued, including the Michigan Daily Editorial Board, that the University should fight back against Richard Spencer under the pretense that his speech would make the campus unsafe. They argue the University could establish legal precedent for other public universities to follow in denying speech requests to agitators like Spencer. Ignoring that a victory for the University would not have binding precedent on other court decisions, the burden of justification for the school is remarkably high. The current precedent held by the Supreme Court decision derives from Brandenberg v. Ohio (1969), ruling that the government cannot suppress speech unless it is “directed to inciting or producing imminent lawless action.” Considering this precedent has protected public freedom of expression for unabashed Nazis in numerous decisions, the University has an abysmally weak case. We believe this legal precedent exists for good reason. The Supreme Court opinions behind it are multitudinous; they reach a critical mass of sound reasoning for content-blind free speech, from a politically diverse majority of Justices. Even for those prone to extreme and harmful psychological distress upon exposure to hateful ideas, there is a simple solution: don’t listen to Spencer if you don’t want to. If the University of Michigan were able to block Richard Spencer from his speaking engagement due to the unsavory nature of his ideas, we as Michigan students and American citizens would face a dire threat to our civil liberties. As a public institution, the University can not be granted the authority to decide what is acceptable speech. If Spencer is barred this principle would be severed – it would thereafter be within the school’s (and thus, state’s) power to monitor all campus speech for unacceptable content and to censor any such speech. To the editors of the Michigan Daily this might sound like an appealing response to noxious speech such as the racist fliers posted around campus over the past year. However, they must understand the legacy of our campus free speech laws. Most of the 20th century’s landmark cases on free expression at public universities were not concerned with discriminatory speech; they were concerned with speech suspected of Communist sympathies. The principle one must draw from this is one of consistent liberties in the face of changing times and moral concerns. While American society has largely eschewed the Communist witch hunt of the ‘red scare’ McCarthy era, we must not forget how quickly some turned to censorship in the face of growing fear around the Soviet Union. Much like the brand of totalitarian communism we feared from Stalin’s Russia, racism is dangerous and holds a grim and bloody history. However, we cannot conflate speech supporting these ideologies with the historical violence they actually produced. Contrary to rhetoric popularized by activists, speech cannot be violent. Obviously this is true from a physical standpoint, as common sense would dictate. Even for those prone to extreme and harmful psychological distress upon exposure to hateful ideas, there is a simple solution: don’t listen to Spencer if you don’t want to. This perfectly workable solution seems lost upon the ad hoc group #StopSpencer, who recently orchestrated a “Week of Action” in the form of multiple protests, strikes, and demonstrations across campus. Such outbursts fundamentally misunderstand the complexities surrounding these negotiations. While we at the Review certainly support one’s right to protest, we find these outpourings of outrage hold the university to a far too quixotic standard. Richard Spencer is the Hydra of our modern times; cutting off one appearance can only lead to more. These protests, rather than advocating for a just cause, portray student activists as stubborn and completely ignorant to the issues of free speech and legal precedent that plague a rejection of Spencer’s appearance. It seems as though students will not rest until the administration denies Spencer’s request, even though their demands might bring even greater harm to the University. 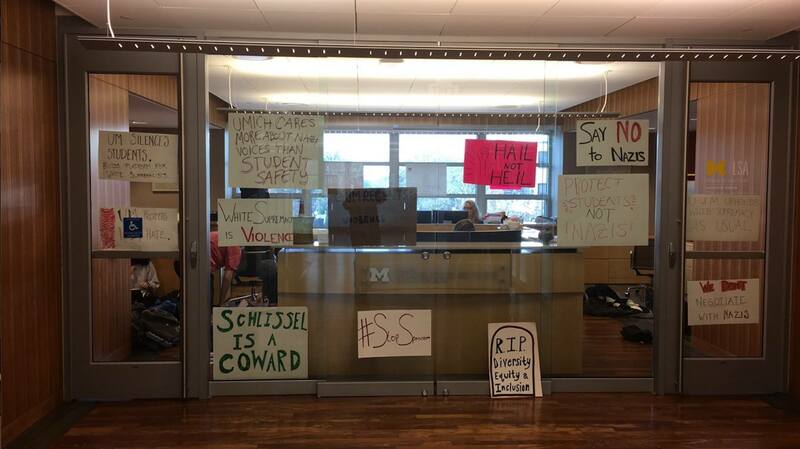 Again, we support every student’s right to protest, but these protesters must at least acknowledge the difficult situation the University finds itself in. Instead, we see students blindly criticizing the administration for not getting what they want. Demanding the University to follow student requests on a whim is absurd, especially when what they’re demanding might bring even more attention to the man they seek to expel from campus. Richard Spencer is the Hydra of our modern times; cutting off one appearance can only lead to more. Student activists appear fundamentally unwilling to address this fact. The Michigan Review Editorial Board unanimously condemns the ideology of Richard Spencer, as well as the actions of his supporters. The Board is also unanimous in our belief that ideologies such as Spencer’s can only be eradicated through exposure to the light of truth. Relegating racism to darkness, forcing it out of the public eye, does much more harm than good. Such ideas take a more monstrous and radical form while festering underground – a form much harder to fight back against. If we approach Spencer’s ideas head-on, however, we may expose them for what they are: shallow pandering to tribal impulses, designed to breed hatred and resentment among disenfranchised whites and imbue them with a false sense of superiority. Only with the clarity that rational discourse can provide can we take the wind out of Spencer’s sail and bring his supporters back to reason. A university is not a “public institution”. It is a marketplace. It’s like a shopping mall that sells knowledge. The students have the right to the learning environment they paid for. I realize there are a lot of Liberal nabobs who’d love us to believe that there’s a significant cohort of students who request speakers like Richard Spencer, but I’m not buying it. Someone in the administration is responsible for letting them in.